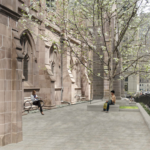 Today the New York City Landmarks Preservation Commission (LPC) approved a major revamp of Trinity Church, the storied Manhattan house of worship where Alexander Hamilton is buried. The parish tapped Murphy Burnham & Buttrick (MBB) to lead the renovations. 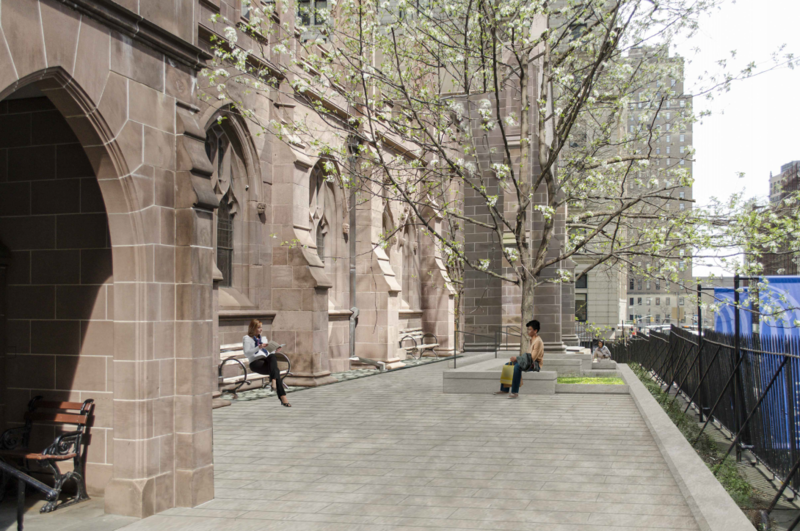 In addition to interior repairs, the New York firm plans to add wheelchair-accessible ramps around the perimeter of the building and install a low canopy on the church’s south side to shelter its weekly processions from the elements. Unlike many New York–area churches that struggle with declining attendance, Trinity is thriving. The Episcopal congregation attracts around 400 people on a typical Sunday, said Trinity Church Vicar Philip Jackson. 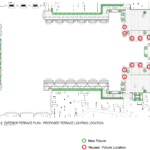 The goal of the renovation is to enhance the experience of worship, address deferred maintenance, and make the church and property accessible via an ADA-compliant path around the perimeter. 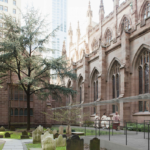 Parishioners, many who live in Battery Park City, Tribeca, and the Financial District, the church’s home neighborhood, participate in a formal Episcopal service. Jackson explained that a hallmark of Sundays at Trinity Sunday is the long procession that winds from the outside into the main hall. To protect the priests and worshipers walking outside from inclement weather, the church asked MBB to construct a glass-and-painted-steel canopy along the lower portion of the windows on the original building’s south terrace and along the Manning Wing, a 1966 addition. The area will also be re-paved in bluestone (PDF). “We designed an awning as minimal and deferential to existing architecture as possible,” said MBB Founding Partner Jeffrey Murphy. 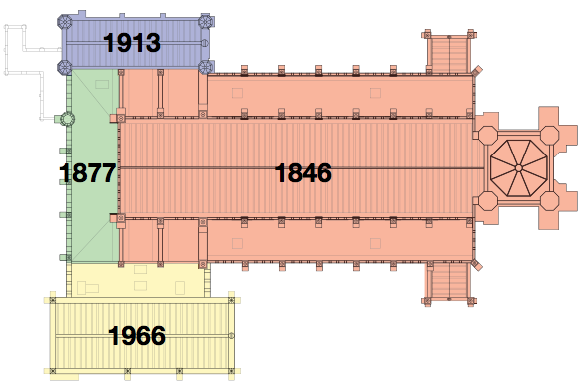 The parish is almost as old as New York itself. 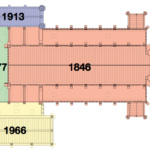 Trinity was founded over 300 years ago, and the church moved into its current quarters in 1846. The original structure, at 75 Broadway, was designed by Richard Upjohn in the Gothic Revival style and landmarked in 1966. Three subsequent additions, the latest from the same year as the landmarking, honored the original design, but the interior hasn’t undergone a major renovation since the mid-1940s. Inside, MBB will replace deteriorating stained glass, and restore doors and masonry that are aging poorly. 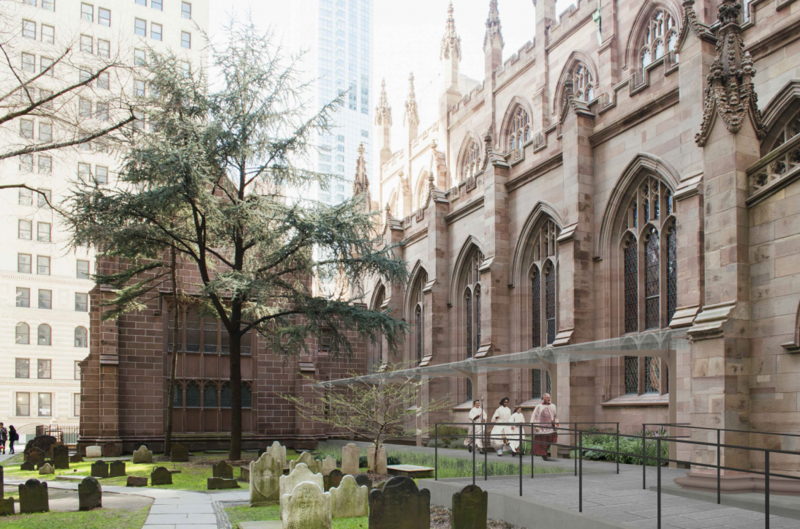 The firm, which is known for its sensitive renovations of historic structures, completed a top-to-bottom restoration of James Renwick’s St. Patrick’s Cathedral in 2015. Although Trinity Church is first and foremost a house of worship, it is also a major tourist destination. Visitors have always stopped by to pay respects to permanent resident Alexander Hamilton, but the founding father’s gravesite has become even more popular since Lin Manuel Miranda’s Broadway musical Hamilton debuted. 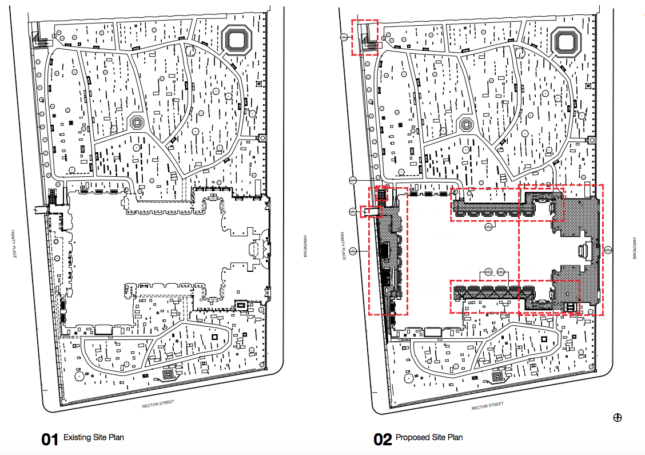 To legitimize the cemetery’s well-worn desire paths and accommodate an influx of visitors, the team is improving the graveyard’s walkways in accordance with an LPC-approved landscape master plan. 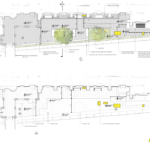 The architects are also working with an archeologist before breaking ground to scope the graves in the yard and the markers around the church, and any stones that need to be moved will be re-instated before the site project re-opens to the public. 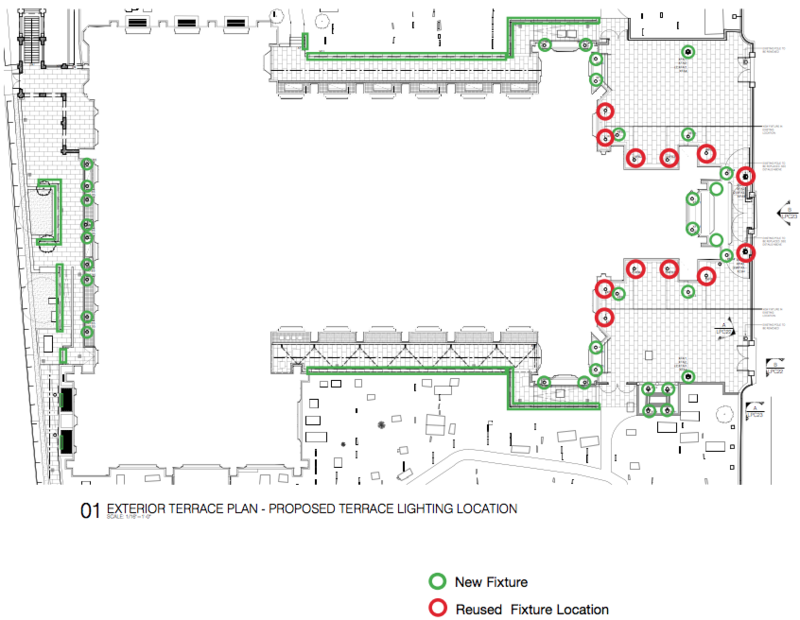 On the west side, MBB will expand the terrace’s loggia by one bay so people can be shielded from the elements, and it will add a paved plaza, pictured above at right. 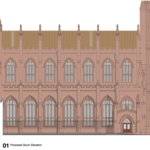 The team will also remove fencing around the site, and retool the lighting scheme to highlight the church’s signature brownstone buttresses. “In general it’s a really thoughtful, well-done proposal. All the details are really well-thought through and totally appropriate,” said LPC Commissioner Michael Goldblum. Preservation advocacy group Historic Districts Council (HDC) mostly agreed, but thought MBB and Trinity could refine the design of the canopy and western terrace. 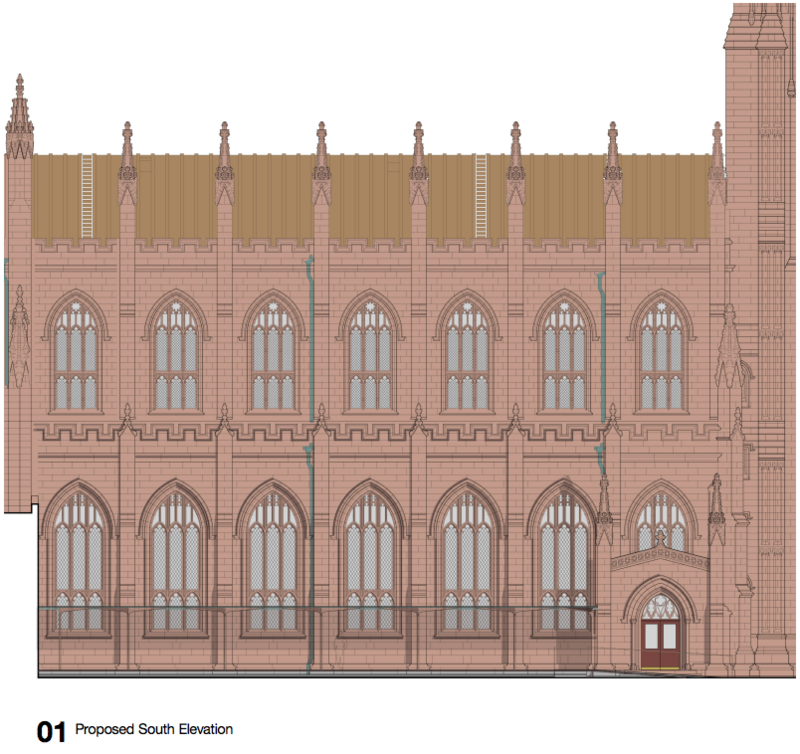 After a short discussion, the LPC approved MBB and Trinity’s proposal with modifications. 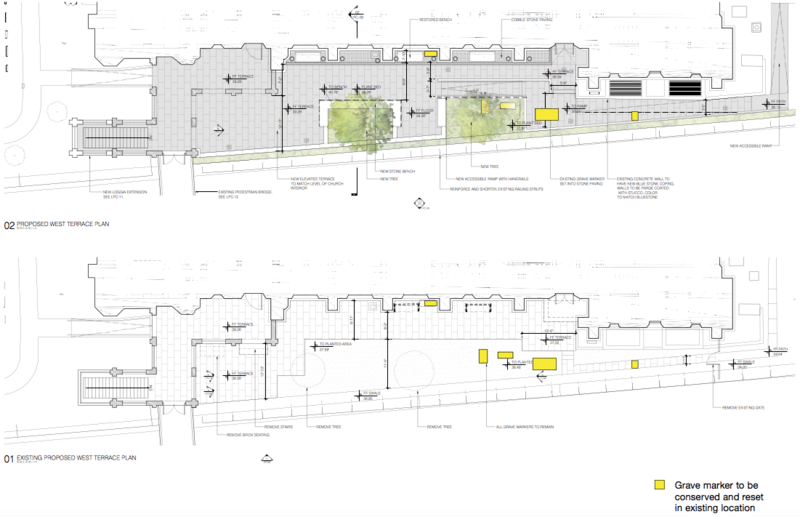 The team will have to work with staff to rethink the design of the canopy, paving, and landscape.